Hilton Worldwide is the largest hotel chain in the U.S. and the second-largest globally, with more than 913,000 rooms across 113 countries. The company’s loyalty program, Hilton Honors Rewards, is also one of the most popular among travel-minded consumers, boasting more than 82 million members. The ability to earn free nights is Honors’ main draw, while other perks include specialized check-in/check-out procedures, the potential for room upgrades, discounts on activities, and complimentary breakfast – depending on your status level. But is Honors the most rewarding hotel loyalty program out there? And how can members maximize their earnings at the lowest possible cost? We’ll explain all of that and more below. No rewards program is perfect. They all feature legitimate perks, marketing fluff that won’t get you much in practice, and a fair amount of fine print to confuse matters. The following breakdown of Honors’ strengths and weaknesses will give you a quick sense of the program’s overall value proposition. To put it simply, you’ll earn Honors points on purchases made directly from Hilton properties – such as hotel reservations, in-room movies and room service. Within this framework, there are two types of Honors points: 1) base points and 2) bonus points (or bonus miles). We’ll explain how they work as well as how to choose between Hilton’s earning styles below. Base Points: All Honors members earn at least 10 points on each dollar they spend through Hilton properties. The higher your Hilton elite status, the more base points you will earn. Elite Status: The Honors program has four different status levels. Each provides unique benefits, including base-point bonuses and additional free nights. You can find a comparison of these status levels, their associated perks and qualification requirements in the next section. Honors Credit Cards: Opening the right Honors credit card will enable you to supercharge your earnings, especially since you’ll be able to rack up Honors points without actually visiting a Hilton hotel. Not only do most of the chain’s credit cards have attractive initial rewards bonuses, but they also enable you to earn free nights when spending money at grocery stores, gas stations, pharmacies, etc. More information about Honors credit card offers can be found below. Honors status levels range from Blue (the lowest) to Diamond (the highest). Each provides unique benefits and has its own eligibility requirements. The following table will help you quickly compare status levels and strategize about how to maximize your savings. While the Hilton credit card power rankings may fluctuate due to changes in their initial bonuses or based on a given individual’s particular spending habits, a clear hierarchy currently exists when you consider all use cases. Ascend is the obvious leader of the Hilton Honors pack, with both a hefty initial bonus and attractive ongoing perks, followed by the standard Hilton Honors Card, Reserve and the Visa Signature version – in that order. You can find a quick breakdown of the best options for different types of applicants below. The number of free nights listed along with each card reflects WalletHub’s calculations for what the average person would earn based on their intended use and the number of nights spent with Hilton each year. For a full review of Hilton’s card offers, check out WalletHub’s guide to choosing the best Honors credit card. How Much Are Honors Points Worth? Each Honors point is worth roughly half of one cent ($0.0055), on average, when redeemed for a free night at Hilton Worldwide properties. Of course, the value of a point will vary based on the city you’re staying in, your hotel’s classification within the Hilton portfolio, and your dates of travel. Weekends and peak dates for your destination of choice tend to be more expensive than weekdays and the shoulder season (the period between peak and off- seasons). The graph and table below reflect pricing and point redemption data for all of the Hilton-owned locations in 10 of 2018’s most popular destinations – 6 domestic and 4 international. This information will further illustrate the variance that exists among Honors point valuations as well as help you determine the number of points needed for a free night in major cities around the world. 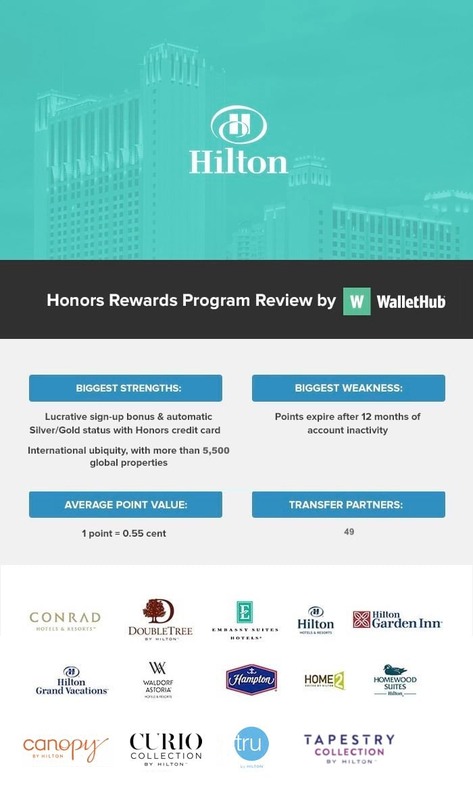 WalletHub compiled room costs and rewards stay point totals for all of the Hilton Worldwide hotels – including popular sub-brands like DoubleTree, Embassy Suites and Hampton Inn – within 15 miles of the city center in 10 of the most popular destinations for U.S. travelers in 2018, according to booking data. We chose six domestic destinations (Puerto Rico qualifies as domestic since it is a U.S. territory) and four international destinations in recognition of the fact that domestic travel is more common (not to mention more affordable). For each destination, we compared the cost of purchasing a room with Honors points versus cash in order to calculate point valuations. We did so with four sets of dates (three nights per stay) in order to see how valuations compare for peak travel dates, shoulder season, weekends and weekdays. The minimum and maximum numbers of points needed for a free night as well as the best and worst value hotels for each destination are based on these dates. As a result, specifics may be different when it comes time for you to book a trip. Honors members have more than 20,000 options from which to choose when redeeming points, according to Hilton’s website, and these items and experiences range in cost from 20,000 to 2 million points. While you might assume that everyone redeems for free nights, Honors members actually purchased 95,800 items (worth roughly $8.1 million overall) from the Hilton Worldwide Shopping Mall – in addition to booking 5.4 million reward nights. The thing is, each type of redemption – merchandise vs. gift cards vs. free nights, for example – offers a different value proposition. So, using your Honors membership to garner benefits other than complimentary reservations may result in leaving money on the table. Below, we break down Hilton’s main redemption categories in order to help you determine how often you’ll be able to reap competitive earnings. While Hilton’s website mentions rail partners, none seem to be currently available. Concert Experiences 1 point = 0.56 cent Premium tickets to concerts and comedy shows through Live Nation. Sound-check and backstage passes available for certain acts. Now that you’re familiar with the major components of Hilton’s Honors Rewards, it’s worth exploring some of the program’s finer points. The following guidance will help you finalize your decision about whether to join Honors as well as better manage your account if you decide to do so. Shoulder-Season Weekdays Offer The Most Value: Points are worth 0.52 cent each when redeemed for weekday reservations either a few weeks before or after a city’s peak tourism dates. Booking for one of these periods will save you 20% compared to the most expensive dates (high-season weekends). Ill-Timed Bookings Can Reduce Point Value By 40%: As you can see in the valuation section above, the purchasing power of an Honors point fluctuates based on demand. So, choose your travel season and dates very carefully in order to get the most bang for your buck. Earnings Expiration: Earned Honors points expire after 12 months of account inactivity. You can stave off inactivity by earning or redeeming Honors points or staying at a Hilton-owned hotel at least once per year. You can also automatically re-qualify by keeping a Hilton credit card open and in good standing. Hotel Categories: Hilton hotels are classified into categories based on how nice/costly they are, with Category 1 being the lowest rung and Category 5 the most upscale. The number of points needed for a free night at a given hotel is directly correlated to its categorization. Remember this when booking rewards nights, as you might be able to save money if you’re torn between two properties that happen to be classified differently despite being equal in your mind. Fine Print: Looking only at the large-print text on any loyalty program’s website can lead to some costly misassumptions. To get the full story about any particular membership feature that appeals to you, make sure to review all related post-scripts and see what the terms and conditions say about the matter. Booked a room here and had plenty to choose from in the area. The hotel was clean and friendly people. The hotel began renovations that day and the fumes were nauseating, the poor hotel workers could hardly deal with it. I couldn't use the gym, pool or eat at the restaurant due to the fumes. Fumes like this are very dangerous and I called Hilton honors to discuss the situation. I asked for a supervisor and they gave me Evelyn, after discussing the problem and severity of it her response was "if you get sick keep the doctor's bill." Evelyn did not try to transfer me to a hotel or anything, terrible experience at this hotel.